Gamakatsu – www.gamakatsu.com– Gamakatsu makes premium, sturdy hooks that stay sharp after multiple fish. Gamakatsu makes a wide variety of hooks that can be used for a multitude of different applications. Power Pro – www.powerpro.com – Power Pro is a braided fishing line that is excellent for fishing deep water applications or when sensitivity and no stretch are key. Power Pro is very supple and has no memory making it very easy to work with. Pro Troll – www.protroll.com – Pro Troll has a great line of products for salmon and trout trolling and now several bass lures that are all integrated with their patented e-chip technology. This e-chip emits vibrations that mimic a wounded bait fish and a lot of times the e-chip is the key to triggering bites. Rocky Mountain Tackle – www.rockymountaintackle.com – Rocky Mountain Tackle Company has created a broad line of kokanee salmon and trout tackle that gives the angler a supreme edge when dialing in a specific action and color that the fish are hitting. New colors and products seem to come out every year. Shimano – www.shimano.com – Shimano has been known for its great fishing reels for years, but they also have an incredible line of very sensitive, high graphite rods. A shimano rod and reel combo is hard to beat for sensitivity with a smooth drag and the customer service is awesome! StrikeMaster– www.strikemaster.com – StrikeMaster ice augers are lighter, faster cutting, and more fairly priced than any other auger on the market. If you do a lot of hiking to your spot or like to move a lot, Strikemaster has you covered with several light, yet highly efficient auger options to choose from. Additionally, these augers are very dependable and can stand up to harsh ice fishing elements year after year. I’ve used several augers from competitors and StrikeMaster is by far the best! Wright & McGill/Eagle Claw – www.wright-mcgill.com and www.eagleclaw.com – These two brands are the same company, but between the two they produce a lot of great fishing hooks, rods, reels, fly rods, fly reels, waders, and a lot of other fishing apparel and accessories. Eagle Claw has also just come out with the new Trokar hook that was modeled after surgical blade technology. Trokar is a sponsor of the FLW 5280 Team tournament series and so far these hooks have been IMPRESSIVE! Local Business Partners – Sport Fish Colorado is proud to be the featured Blue Mesa Fishing guide for Lakeside Resort, located on Blue Mesa reservoir and Mesa RV Park, which is located just west of the town of Gunnison on your way to Blue Mesa. Book your Ice Fishing trip Today! Why choose us? We pride ourselves on giving you a safe, first class experience! 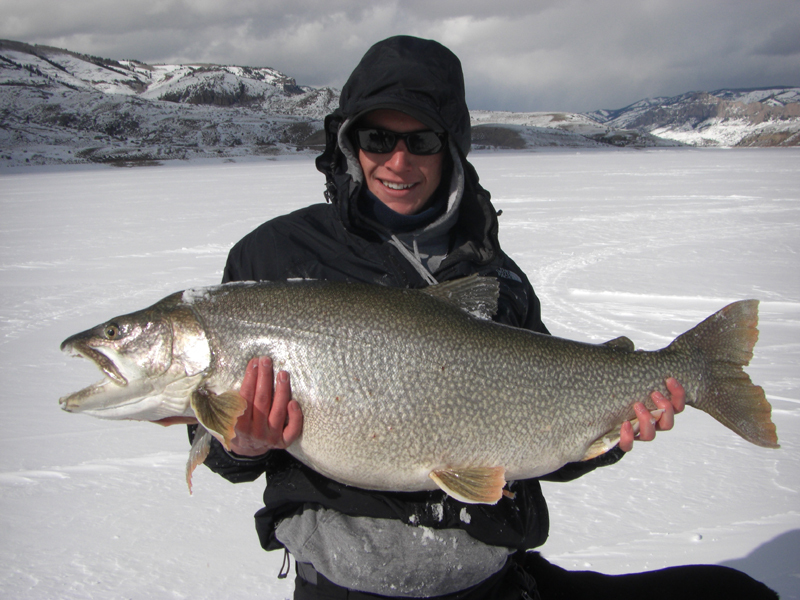 Let our friendly, experienced, hard working guides show you what Colorado Ice Fishing is all about! Our Trips are EXCLUSIVE to you and your party and your guide will be at your beck and call at all times! Check out our reviews on Trip Advisor! Ice fishing conditions and action still great! We still have plenty of safe ice across the state providing us with some great action for rainbow trout, cutbow trout, kokanee salmon, brown trout, and some trophy lake trout! Take advantage of the great fishing and warmer ice fishing weather before it’s gone! Blue Mesa Ice Fishing Tournament March 2. Great conditions and Great Ice Fishing! We have thick ice across the state and the fishing has been great for rainbow trout, brown trout, kokanee salmon, and lake trout! We should have safe ice through early to mid march on a lot of our Colorado lakes and reservoirs! Don’t miss out on the action! Find your outdoor property with Robby! Subscribe To Updates & Specials!